For a while I have been interested in the idea of using motion detectors on timers in order to merge convenience with energy conservation. I have noticed this works particularly well in some of the common areas I work in, and was reminded by the bath in my fiancee’s home, so I decided to check it out for myself and see how it worked. Enter the uSwitch Motion Sensor Lamp Switch. The idea behind motion-activated lights is the ability to turn on and off your most used lights more easily. The prototypical environment for a motion-activated light is in an entrance hallway or bathroom, a space that is not used often or for a long period of time but where having a light already on can be useful. No body wants to leave their entrance lights on all night, but as we all know it’s always troublesome coming home late and having to fumble for the light switch in a dark house. By making your lighting need-based, you eliminate waste without added effort. My test motion sensor switch was procured from Brookstone, and was chosen because it had good reviews and looked like it would fit the bit. Besides your basic motion sensor features, the uSwitch also featured an LED night lamp, customizeable timers (including always on position), and ambient light sensor. Out of all these features I found the ambient light sensor to be the best. It could stand to be a little more sensitive, but its basic function is to prevent the lamp from turning on during the day or when there are already other lights on. This means that your lamp won’t be flicking on an off when it’s not needed, and the LED lamp won’t be burning when you won’t notice it, a very nice touch, to be sure. Overall, I was very impressed with the unit. 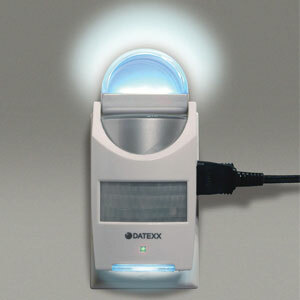 The motion sensing reaches all corners of the room, even outside of the stated range capabilities. It’s also very reliable and does everything I expected. The only complaint is that it sometimes turns on when the room is half lit up, but this may be because of the positioning of the lights relative to the sensor, which is kind of jammed in a corner. Of course, it’s impossible to say exactky how much I’ve reduced energy usage. Since lamp use in that room is sporadic at best, I can’t make any reliable judgments, but I can say that during times of frequent trips back and forth through the apartment the main living room lights have spent less time on since the motion sensor takes care of any light I need. At the very least, it’s an incredibly convenient gadget to have for just $30, and it’s definitely helped me conserve some energy in the mean time. We have one of these in our dining room because all we usually do is walk through it. It doesn’t have the ambient light sensor though, and I didn’t know they were available. Going to have to bookmark this one!